There are towing agencies that own and use specialized equipment to tow your vehicle safely without any additional damage to it during the process. If your car is mangled from an accident, it can be carried to the repair shop by these specialized vehicles. 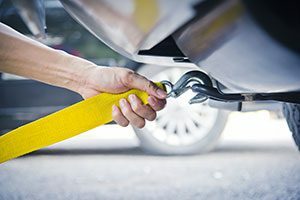 Towing essentially refers to physically lifting or pulling your car to a specific destination, usually a vehicle repair shop. You might need car towing services for a number of reasons. You may simply run out of fuel in the middle of nowhere, or your vehicle may refuse to start. You may have a road accident which renders your vehicle useless on the road till it is repaired in our auto collision repair shop.